Super Channel, the No. 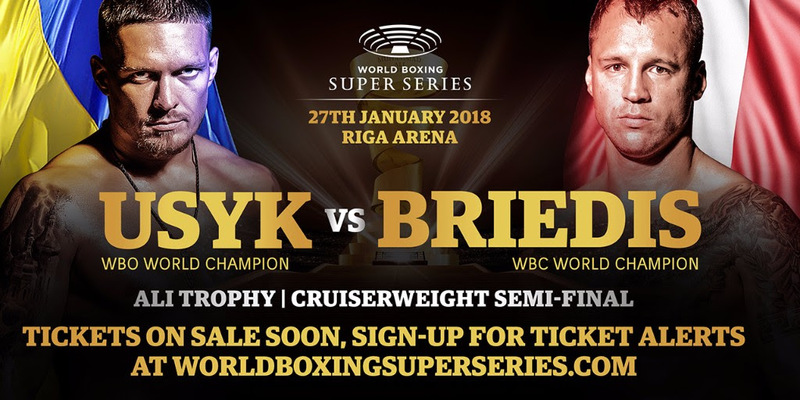 1 destination network for Canadian boxing fans, will air the upcoming semifinals of the popular World Boxing Super Series (WBSS) tournament, featuring world-class cruiserweight and super middleweight divisions action, live from various venues in Europe. Super Channel acquired exclusive rights in Canada to air the entire WBSS tournament from MP & Silva, a leading international media company that provides media rights, digital, technology and sponsorship services. WBSSis a revolutionary bracket-style elimination tournament featuring the world’s best boxers and a total of $50 million in prize money. The knockout format of the competition will see the best boxers ultimately compete for the Muhammad Ali Trophy, the greatest prize in boxing. The tournament is organized by newly-founded Comosa AG, a Swiss-registered company with principal owners Highlight Event & Entertainment, Modern Times Group and Team Sauerland. Comosa AG is working in partnership with boxers, promoters and managers around the world, and in alignment with the four major world boxing federations, to create a new global platform for the sport. The first of its kind tournament, which is planned to take place on an annual basis, kicked off this past September with quarterfinals competition in two divisions, cruiserweight and super middleweight. An expert panel invited the world’s best boxers to compete, namely the top 15-ranked fighters of the four major federations: WBA, WBC, IBF and WBO. The winners of the two semifinals will advance to the championship round in both divisions this May. The two winners in the cruiserweight semifinals will become the first unified world cruiserweight champion since Evander Holyfield in 1987. The eventual WBSS cruiserweight world champion will become the first ever to hold all four major sanctioning body titles – WBC, WBA, IBF and WBO — at the same time. The four cruiserweight semifinalists, who represent four different countries, have a combined record of 83-0 with 68 knockouts. They are also the top three and fifth-highest ranked cruiserweights in the world by The Ring magazine’s independent ratings. OLEKSANDR USYK: Captured the WBO cruiserweight world title January 17, 2016, by way of a 12-round unanimous decision over undefeated, defending champion Krzysztof Glowacki (26-0). WBSS: In his third WBO title defense, he stopped former two-time WBO world champion Marco Huck (40-4-1) in the 11th round. Note: 2-time Ukraine Olympian…. 2012 Olympics and 2011 World Championship gold medalist….twice defeated current IBF light heavyweight world champion Artur Beterbiev – Russia-native now fighting out of Montreal — in the 2012 Olympics and 2011 World Championships. MAIRIS BRIEDIS: He became WBC world cruiserweight champion April 1, 2017, taking a 12-round unanimous decision from Huck. WBSS: Won a 12-round unanimous decision from Mike Perez (22-2-1) in his first title defense. Note: Former professional kickboxer…..also the reigning IBA world cruiserweight champion. MURAT GASSIEV: Won a 12-round split decision December 3, 2016 against three-time world cruiserweight champion Denis Lebedev (29-1) to capture the IBF title. WBSS: Knocked out former 2-time world cruiserweight champion Krsysztof Wlodarczysk (53-3-1) in the third round of his first title defense. Note: Now lives in Big Bear, California, which is known for its rugged training center in the mountains. YUNIER DORTICOS: Knocked out interim WBA cruiserweight Youri Kalenga (22-2) May 20, 2016 in the 10th round and later upgraded to “regular” WBA world champion. WBSS: Stopped Dmitry Kudryashov (21-1) in the second round of his first world title defense. Note: Defected to the USA from Cuba, where he was a member of the famed Cuban National Team, and he lives and trains in Miami, Florida. The super middleweight semifinal round is like a Battle of Britain with three Brits – George Groves, Chris Eubank, Jr. and Callum Smith – and German Juergen Braehmer. All four are ranked among The Ring magazine’s top 10. GEORGE GROVES: Knocked out defending world champion Fedor Chudinov (14-1) on May 27, 2017 in the sixth round to capture the WBA super middleweight world title. WBSS: Stopped previously undefeated Jaime Cox in the fourth round. Note: All three of his career pro losses have been to world champions Carl Froch twice and Badou Jack. Record vs. current or former world champions: 3-3 (1 KO), defeated James DeGale, Glen Johnson & Chudinov. CHRIS EUBANK, JR.: Crowned IBO super middleweight champ February 4, 2017, when he knocked out Renold Quinlan (11-1) in the 10th round, and successfully defended his title July 15, 2017 with a 12-round unanimous decision win over 3-time, 2-division world champion Arthur Abraham (46-5). WBSS: Defended his IBO belt with a third-round knockout of Avni Yildirim (16-0). Note: The son of 2-time, 2-division world champion Chris Eubank, who manages his son’s career. Record vs. current or former world champions: 1-0 (0 KOs), defeated Abraham. JUERGEN BRAEHMER: Former WBA and WBO light heavyweight champion of the world who dropped down one weight class for the WBSS tournament. WBSS: Won a 12-round unanimous decision from previously unbeaten American Rob Brant (22-0). Note: Hadn’t fought as a super middleweight in 10-years prior to the WBSS quarterfinals…30-1 (24 KOs) as a super middleweight and he avenged his lone loss…. two other career losses were to world champions Hugo Hernan Garay and Nathan Cleverly….at 39 the oldest WBSS semifinalist. CALLUM SMITH: The least tested WBSS semifinalist in terms of having faced quality opponents, in addition to being the youngest WBSS semifinalist at the age of 27. WBSS: Took a 12-round unanimous decision from previously undefeated Erik Sjoglund (26-0). Note: Has three brothers who are also pro boxers: Paul, Stephen and Liam….the holder of numerous regional titles including WBC International, Silver and Diamond, as well as European super middleweight champion. In addition to the WSBB quarterfinals, Super Channel aired major boxing events live in 2017 like Brook vs. Spence Jr., Pacquiao-Horn, Eubank, Jr. vs. Abraham, Lomachenko vs.Marriaga and Crawford vs. Indongo.